This salad is the edible version of one-stop shopping. In one bowl, you will find some of the best ingredients and flavors of Italy: Cannellini beans tossed with garlic and lemon, crispy arugula and fennel, Parmesan shavings, and flash cooked calamari coated in olive oil and pepper. Put it all together and you have a light and healthy salad or a heaping topping for bruschetta worthy of a dinner party. Whisk all of the ingredients together in a small bowl; set aside. Combine the beans and fennel in a medium bowl. Pour 1/2 of the vinaigrette over the beans and toss to combine. Heat one tablespoon olive oil in a skillet over medium-high heat. Add garlic and red pepper flakes and saute 30 seconds. Add calamari and saute 2 minutes. Sprinkle with salt and pepper. Transfer with a slotted spoon to the beans and mix together. 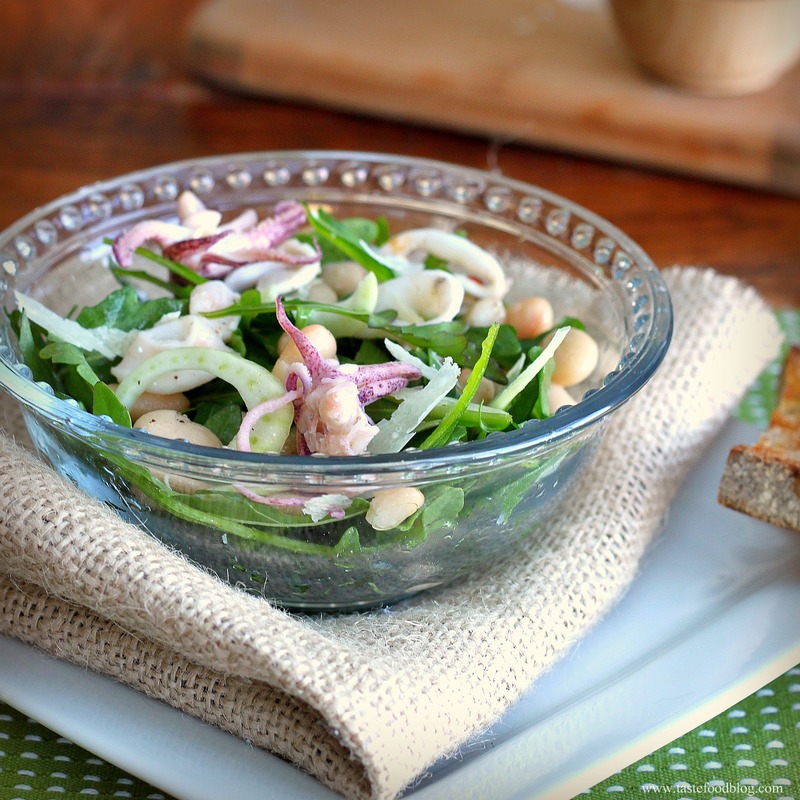 Arrange arugula in a serving bowl. Spoon beans and calamari into the center of the arugula. Drizzle arugula with remaining vinaigrette. Garnish with Parmesan shavings and chopped parsley. Serve immediately. Not a calamari fan (it’s a texture thing) but that salad looks great! Strangely enough, I have never cooked calamari but order it out frequently. After Liz Larkin’s video, I’m buying mine cleaned and ready to go! Lovely photo! Thanks, Liz. I love to order it fried in restaurants. Wonderful flavor combinations! Thank you for sharing this salad and inspiring me with something new! Have a great weekend. Thanks, Georgia. I am glad you like the recipe! Oh Lynda, this stopped me in my tracks! We love calamari and this looks refreshing and healthy. I only wish I could pull up a chair with my fork! I am in the same boat as Liz! Just yesterday I was eyeing the squid at Bi-Rite. I’m absolutely going to have to try this. Lynda, this looks so refreshingly good. I’m making this sometime this week for sure! And your photos are really beautiful!!! I love the addition of fennel in this salad. I never thought of that before. I learn so much here. 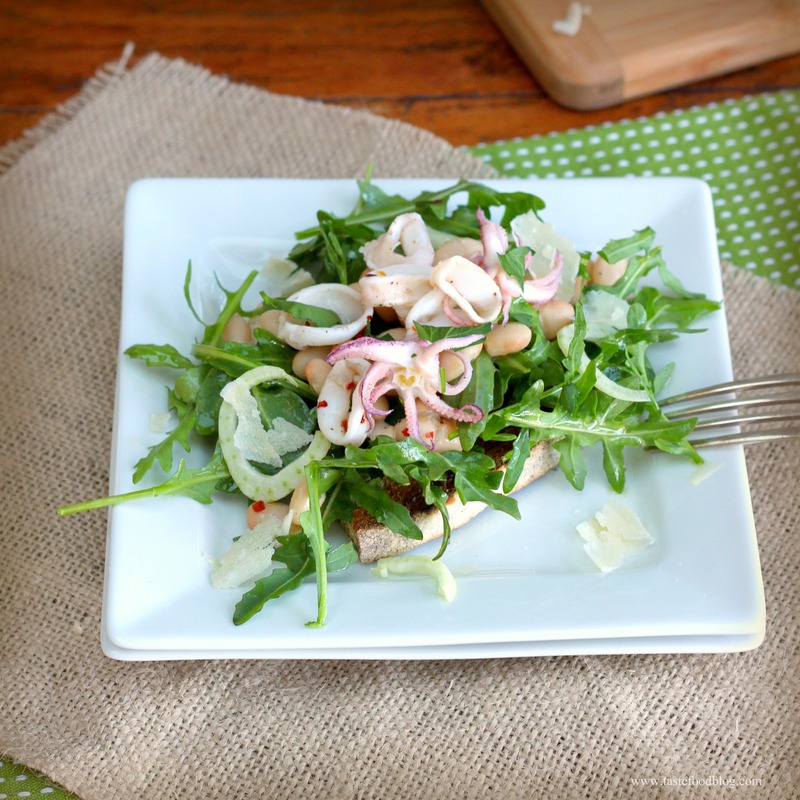 Calamari salad is summer in a dish to me.